A few months ago, connected speaker maven Sonos said it was working on bringing voice control to its speakers. Today, Sonos is announcing a long-term relationship with Amazon whereby you’ll be able to control your Sonos speakers from your Amazon Echo. This is just awesome news. By early 2017, all Amazon Alexa devices—including the Echo, Tap, and Dot—will be able to control the Sonos ecosystem. Which effectively means you can get an Echo Dot as a poor man’s virtual receiver to add voice control to a more complex Sonos experience throughout your house. Update October 4, 2017: Sonos says it’s finally releasing an update to existing Sonos speakers that will let them sync up with Amazon Echoes. The update is coming to devices this morning. Amazon hasn’t released official numbers for it Alexa ecosystem, but analysts estimate that more than 3 million Echo devices have been sold since early 2015. And with Amazon pushing the Echo and Alexa ecosystems so prominently, we can only expect those numbers to increase. Additionally, users will be able to control their Sonos system from the Spotify app, using Spotify Connect protocol that’s been available for a couple of years. Spotify Connect allows the Spotify app to control outside speakers and devices. In the case of Sonos, you can use your Spotify app on mobile or desktop, to send music to a Sonos speaker. You can even do this remotely, so if you’re in the car and want to start a certain playlist or album to start in your living room before you even get into the house, you can do that. Users will be able to control their Sonos via Spotify in the next few weeks. Part of being that platform is working with every service and platform available to users. Already, Sonos does a pretty good job in so far as it supports basically every streaming audio service you can think of.. Sonos works with Spotify, Apple Music, Pandora, Amazon Music, Google Play and more. The move to embracing voice assistants makes sense for the wireless speaker company. In March, Sonos announced it was laying off some of its staff and focusing its efforts not as much on the hardware devices that made the company famous, but on software. And in 2016, software improvements inevitably means voice control. It’s notable that Sonos’ commitment to improving its software means embracing the software made by others. For years, Sonos users have complained that its own apps were often a pain to use. And although Sonos is working on streamlining that software, giving full control of the Spotify experience to Spotify—and the Alexa experience to Amazon devices—signifies that Sonos knows that is role as a platform doesn’t necessarily have to include making its own software front and center forever. 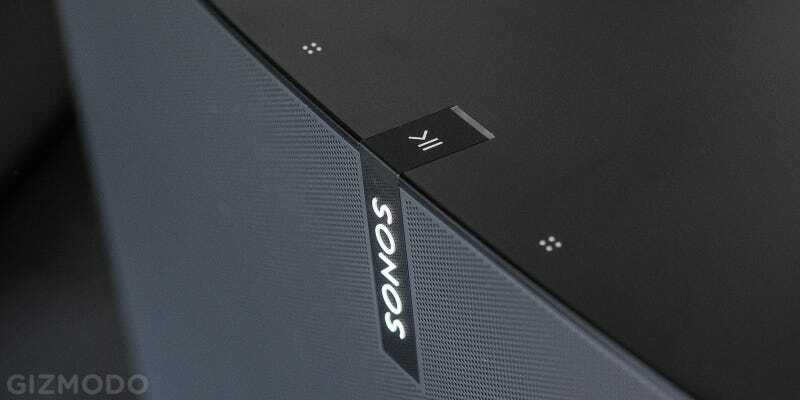 Sonos is so beloved by its users because its the true definition of a product that just works. Still, we’d be lying if we said it didn’t feel like Sonos’ mojo had stalled a bit, especially in light of other competitors in the wireless speaker space. But getting reliable, usable voice control from Amazon, has the potential of making an already great experience even better. Meanwhile, Amazon has a great, if nascent, technology with Alexa. But the app and device platform, while growing, has lacked its killer app. I think Sonos support could be Alexa’s killer app, especially for music lovers. If you’re a Sonos and an Echo owner, this should be a very happy day.